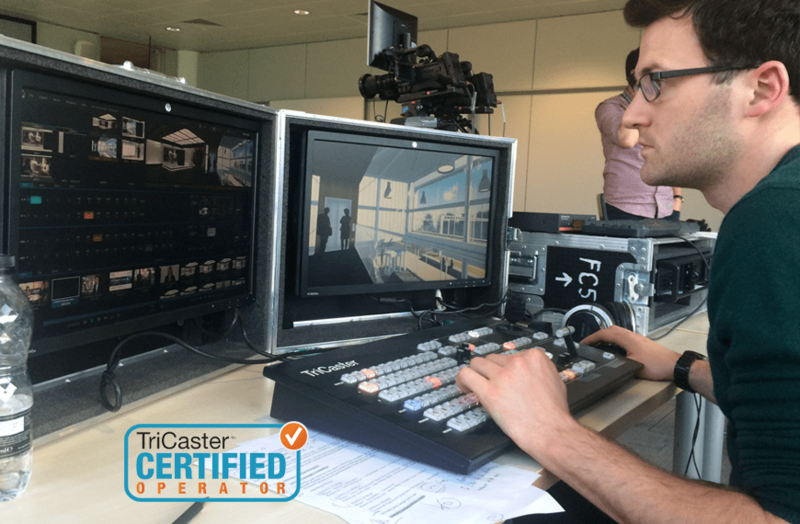 I’m pleased to say that I’ve recently become a Certified NewTek Tricaster Operator in the UK. I’ve been using my Tricaster 460 to create corporate videos and film and stream live events and conferences for the last 6 or 7 years, but it’s always nice to have your skills and experience officially recognised. Since launching this website earlier this year, passing the exam became a higher priority as running “TricasterOperator.co.uk” and not being certified by NewTek felt a bit like being a taxi driver working without a licence – you know you can drive, but it’s probably a good idea to have proof if someone asks! When I started looking into it in more detail I have to say I was surprised by just how comprehensive the exam was and how tricky some of the example questions were. The NewTek site has a great range of training videos that go through each of the ten sections that make up the final multiple choice exam. Some of the content can be a bit heavy going at times, but the level of detail is great and going through them is probably the only way to ensure you take in all the information that’s needed to achieve the 70 % pass rate. There are official testing locations all over the world, but my local centre in the UK is at DigiBox in Harpenden. Steve Greenham handles everything to do with training and the exam itself and offers training and advice and has also put together a great page on their site giving more information about exactly what is involved in the certification process. It’s really great to be a Certified Newtek Tricaster Operator in the UK and be put on a list alongside other experienced Tricaster users across the world. Now that I can officially be trusted to run and manage complex live events and productions, please do get in touch if you want to find out how I can work with you on your next production.